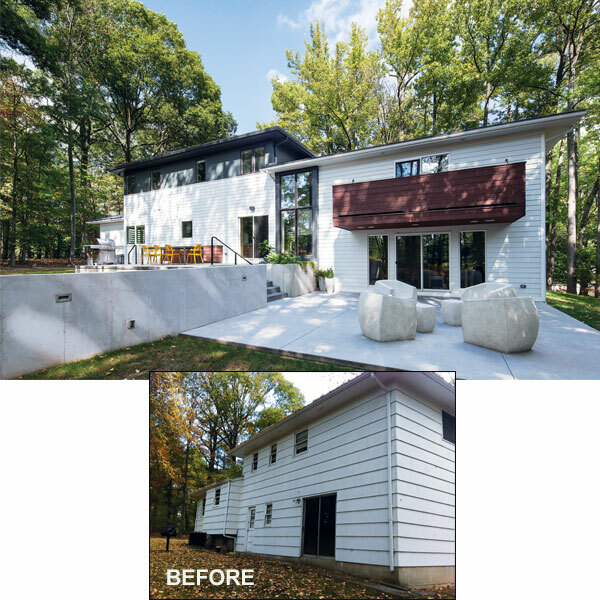 Rear exterior • A lackluster rear facade was livened up with the addition of a cedar balcony off the master bedroom. The two-level patio is a practical addition offering easy access from different floors. The addition at the top of the house (at left) created “a higher ceiling on that level. We needed the new structure for the opened-up plan and for the new bedroom level,” Rosard says. The wide staircase linking the two patios aligns with the one inside. A soaring ceiling allows views to the mezzanine from the kitchen and lower living area. The sculpture on the ceiling is made from wax. The modern kitchen is bright and airy thanks to an open plan and unadorned windows. Rosard widened the steps from the foyer up to the living room and down to the family room to improve sight lines between levels. Black basalt floor tile helps the foyer stand out from the oak flooring in the rest of the house. Staircase • A view from the foyer into the downstairs living area: The sculptural staircase is a focal point of the entryway. In the home’s original plan, there was no stair from the entry to the lower level. A split-level takes on a new identity. The split-level home—it’s an architectural style perhaps best known from the Brady Bunch television series and often dismissed as a midcentury folly. But take away the retro accents (though that avocado and burnt orange kitchen was totally groovy) and this 1960s stalwart can be a tasteful option that is relevant to life in the 21st century. 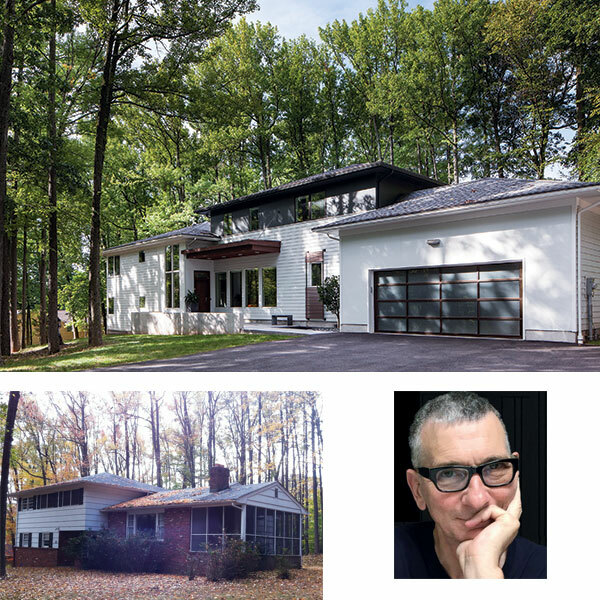 Millburn, NJ-based architect Gary Rosard, a member of the American Institute of Architects who has LEED AP certification, created a modern, sophisticated interpretation of a circa-1960 split-level in Union County by opening up the space and broadening sight lines, thus establishing each level as part of a cohesive whole. 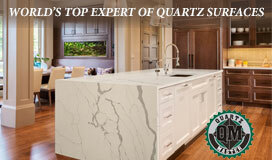 In addition, Rosard incorporated Vastu principals (the Hindu equivalent of feng shui) at the request of the homeowners. Rosard explains the split-level’s rise and fall, and his methods for reviving the style. DNJ: When did the split-level emerge as a home style? Rosard: After World War II, the expansion of the suburbs and a taste for a more modern style led to the building of ranches and split-levels. 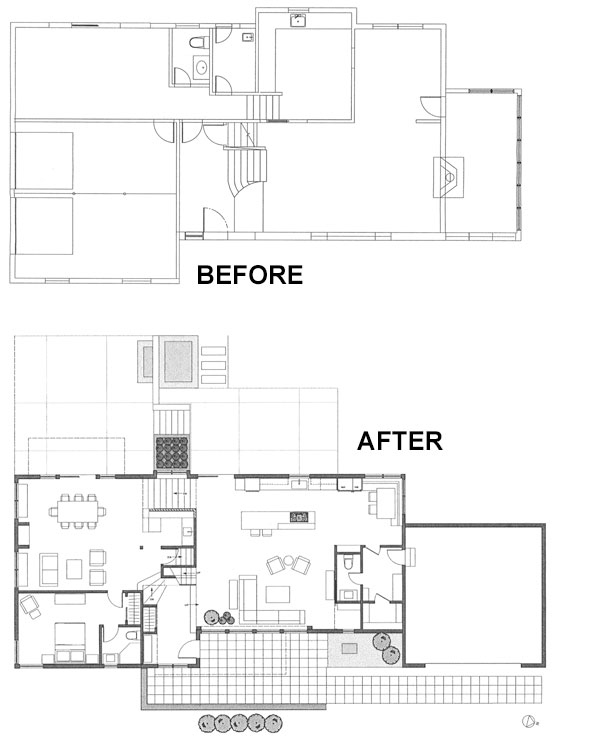 The split-levels worked well on sloped sites and offered an open layout, yet they were more compact than a spread-out ranch so they would work on smaller lots also. In many of the earlier, more customized models, the arrangement allowed for cathedral ceilings in the living room [à la the Bradys] because there wasn’t a second floor above. DNJ: Why is the split-level now so marginalized? Rosard: The problem is that they started to be built economically; the less-expensive versions don’t have the cathedral ceilings. The houses generally lack both the design sophistication of a classic midcentury modern house from the same period or the character and charm of a traditional Colonial or Tudor. DNJ: Can you explain a bit about Vastu principles and how they relate to exterior and interior spaces? Rosard: Vastu principles of design, layout and space arrangement are intended to integrate architecture with nature and beliefs using geometric patterns and directional alignments. The orientation of a building and the spaces within should be designed to have only positive influences on occupants. The position of the building relative to the sun is believed to have auspicious or inauspicious effects for different functions. There is an ideal place for the living room, the kitchen, the meditation room, etc., in any home. DNJ: How did you incorporate those principles into this space? Rosard: The principles informed many of the decisions that had to be made in determining locations and layouts of the various functions of the house. The new garage was situated to provide an ideal entry location on the site, as was the front door. Kids’ bedrooms were organized with study space in the most desirable positions. The kitchen range was positioned for the best orientation when cooking. A carefully located space that was created for the puja—a ceremonial prayer room—was given prominence on the exterior with a decorative grille on the facade and a water feature just outside the window. The sound of water when the window is opened is an exterior signal of the spiritual heart within. DNJ: How did you change the orientation of the rooms? Rosard: The front door was originally on the lower level, with the door facing the street. We built up the floor level so this entry is just two steps below the main living level. 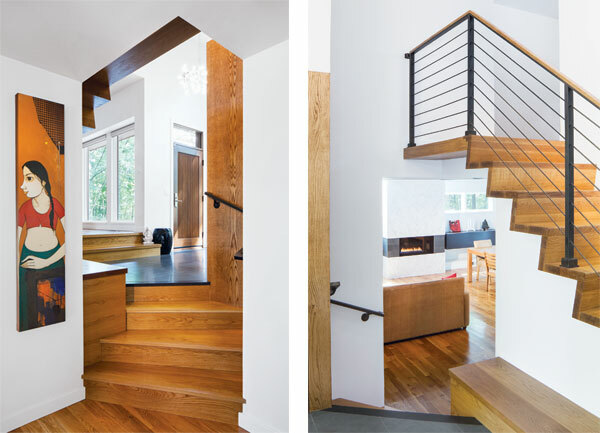 From the entry level, we opened the space to the upper-level ceiling, creating a story-and-a-half entry that provides views to the mezzanine above and the new sculptural staircase. We then added an additional stair down to the lower level from the entry and another wide stair from the kitchen to the lower level. Now this lower level no longer feels like a basement, but is fully integrated into the main living area. The front door is oriented to the new garage. The garage was relocated and built new, which freed up space at the lower level for a guest room and an expanded living area. We rebuilt the walls of the main living area to create a higher ceiling on that level. We needed new structure anyway for the opened up plan and for the added bedroom level above. DNJ: What were some of the challenges of the project? How did you deal with them? Rosard: The biggest design challenge was finding a way to make something special and meaningful out of the split-level arrangement. Once the idea came to create a central “level change” zone opening up the house, everything else followed naturally. DNJ: What do the homeowners like best about their redesigned home? Rosard: They entertain frequently and have long-term visitors from India. The open layout and flow of the house works very well for their lifestyle, and the guest suite on the lower level is ideal for long stays. They are amused and proud of the fact that drivers passing by often stop in front of the house to take an extended look. It’s an unusual design for the area, and they love that they have a very unique home. Overall: architecture, Gary Rosard Architect in Millburn; builder, Greg Porraro, Porraro Homes Inc. in Red Bank; wall color, Benjamin Moore Aura OC-22 Calm; ceiling color, Benjamin Moore Aura OC-21 Winter White (flat). Exterior: “stone” chairs on back patio, Zachary A. Design in Chicago. Entry: custom handrail, International Forge in Haskell; basalt honed-finish floor tile, Virtue Tile in Summit; oak wood-grain panel door (A730), Jeld-Wen Inc.; Connectix LED pendant chandelier, Sonneman—a Way of Light in Wappinger Falls, New York; painting of girl, Anand Panchal. Kitchen: cabinetry, Rempp Kuchen through Luana Design in New York City; countertop, Caesarstone; burnished copper backsplash tile, Seneca Tiles in Attica, Ohio; Corona 31-inch LED rectangle pendant, Sonneman—a Way of Light; refrigerator, freezer, triple combination built-in oven and range hood, Thermador; Talis S faucet, Hansgrohe USA; LEM Piston stools and Knoll Tulip chairs around table, Design Within Reach; table, Restoration Hardware; striped ottoman and orange chair, Roche Bobois. Downstairs Living Area: Fire Ribbon direct vent fireplace, Spark Modern Fires in Bethel, Connecticut; custom black cabinetry R&G Construction Cabinet and Millwork Inc. in North Plainfield, wrapped in Alu Dark aluminum 354 from Chemetal in Easthampton, Massachusetts; wax sculpture on ceiling, Lorrie Fredette in New York’s Hudson Valley; long table, Ethan Allen; daybed and sofa, Crate & Barrel.